In the seaport town of San Pedro, CA amid the suspended bridges, lighthouses and tidal pools, lies the tattoo enclave that is known as TIMELINE GALLERY. Timeline officially opened in March of 2011 by artists Carlos Torres, Allan Padilla and Jed with the intention of creating a shop dedicated to tattoo artists and the various media they work in, in addition to tattooing. Timeline’s grand opening featured over 130 of the finest black and grey artists in tattooing today. In conjunction with the opening was the release of the book “Black and Grey’s Finest” which was put together to raise money for Autism. The guys are at it again with their first annual Timeline Show, which opens this Saturday. 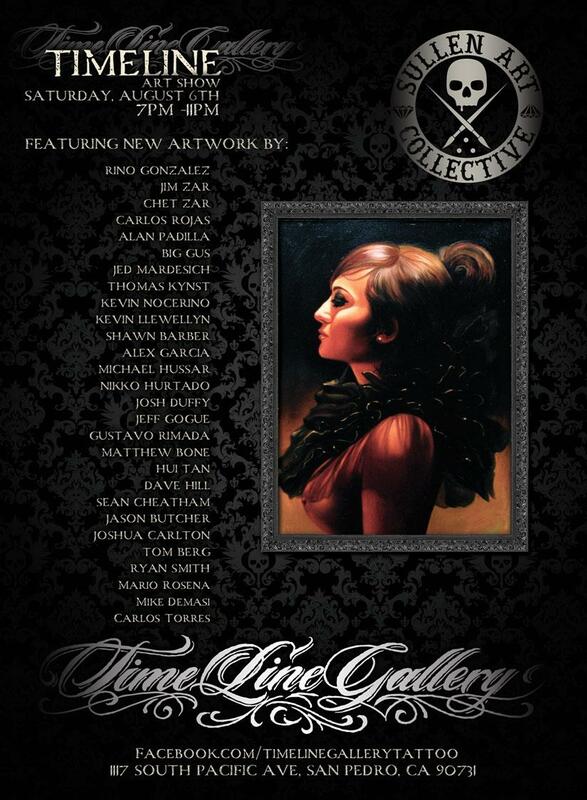 Featuring new works from a Grade A lineup of painters and tattoo artists. The list includes Nikko Hurtado, Michael Hussar, Sean Cheetham, Shawn Barber, Kevin Llewellyn, Carlos Torres, Allan Padilla, Jim Zar and Chet Zar to name a few. This entry was posted in Art Stuff Los Angeles, NEWS and tagged Allan Padilla, Carlos Torres, Chantal Menard, Chet Zar, Jim Zar, Kevin Llewellyn, Michael Hussar, Nikko Hurtado, Sean Cheetham, Shawn Barber, TIMELINE GALLERY. Bookmark the permalink. The show is up til September. There’s no charge and the work is amazing. Tell em Chantal from FAD sent you.